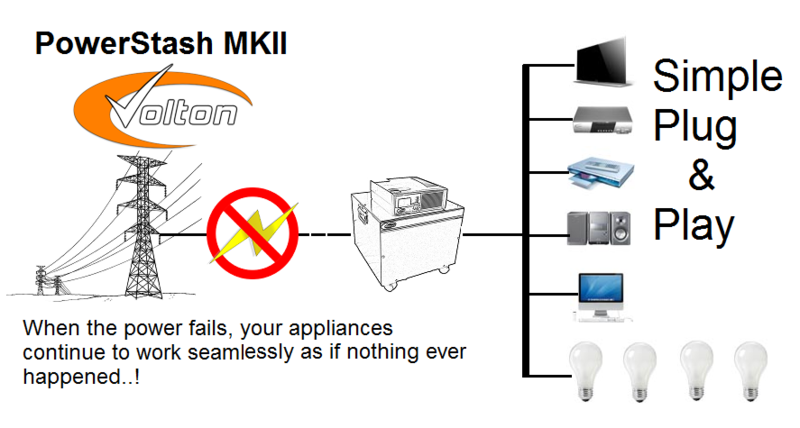 We’re offering the best alternatives to Power Failures! Try our innovative backup power solutions!! The Smarter Way to Power Your Home. Try our innovative backup power solutions!! Need Electricity During Power Failures? Whether you prefer a permanent professionally installed solution or a easy DIY plug & play solution, we can help. We have the best expertise and products for any solution to suit your budget. We Create Power, Cost effectively..! No Compromise in Quality and Service. Ideally the PowerStash is designed to see you through Power Load Shedding so that you at least can have some lights, a TV and maybe a Radio to make these hours more bearable. It is no secret that during these extended times there is very little one can do and time seems to drag on endlessly. It can also be a traumatic experience for small children at night times. It’s really simple – Plug & Play. You simply plug it the inverter into your wall outlet socket and connect your essential appliances and a couple of lights to the multi-plug provided and everything will work seamlessly without any further user intervention. Recharging happens by the inverter automatically and proper battery conditioning and charging is always maintained. It requires no maintenance whatsoever, freeing you to enjoy seamless TV viewing during Load Shedding. The PowerStash Inverter for Backup Power Systems is ideally suited for Home, Small Business and Recreational use. When there is Load Shedding or Eskom power fails, your TV, Decoder, Hi Fidelity System, Computers, and a couple of CF/LED Lights will seamlessly continue to operate. Volton offers customized solutions for the residential home owner and office environment where permanent installations are required. These types of installations add value to your investment and will make the resale of your property easy and more profitable. No more Load Shedding woes. No business can function effectively without backup power during Load Shedding. Computers, printers, switchboards, lighting etc. all contribute to a workable office/business environment. Volton has a cost effective solution that will ensure your operation delivers every time. Every Volton Project will be subjected to strict and cost effective needs assessment. Scaling for proper and efficient reusable energy needs is serious business. We do not compromise quality for cost. Once we have determined what your needs are we will plan the full roll-out to your consideration. We will complete our projects with very little discomfort to you and disruption to you to the highest standards. Once all the equipment is on site inspected and secured, we will start with the installation and complete it within the time frame planned. Our teams are experts and professionally trained for the job. After successful installation, our quality assurance managers will do a final testing and checkout. We pride ourselves to deliver only the best and unequaled service one can only be proud of. Once satisfied that the installation meets all the criteria as set out by local authorities, our qualified engineers will sign off the Certificate of Compliance and give you the go-ahead for Switch-On..! I love my PowerStash. Ever since I saw this at a friends house I knew I wanted one and I can say that it has been the best decision I have ever made. I Live on my own with my 4 year old son and we now have the freedom to watch his favorite programs on TV hassle free. Thank you Volton. Now I truly have a system that I can be proud of. No more running out to start the generator. No more noise and fumes. No more Decoder resets. Power Outages is now not an issue in my family’s life. I have beaten the Dark, thanks to my PowerStash. I love my Inverter, but my grand children love it way more. No more sighs of disappointment when Eskom goes belly up.. especially at night time..! Since the purchase of my PowerStash, load shedding has had no effect on my life. It was always frustrating to sit in the dark without any TV or lights to carry on with my normal doings. Now I am able to enjoy my TV Sport when I want to. and even carry on working on my computer. Besides my PowerStash redefining our TV enjoyment during Load Shedding, the delivery to Britstown was right to my door in only 5 Days. I cannot bloody believe it!! I bought the PowerStash MKII, and am so soooo disappointed! Why am I disappointed? I am frickin disappointed because I wasted so much money and effort on another knock-off inverter. To my amazement, the PowerStash works right out of the box as outlined in the description. I’m glad that I purchased one at last. Thank you, and great work. We'd Love help you get the best Power Solution money can buy..!